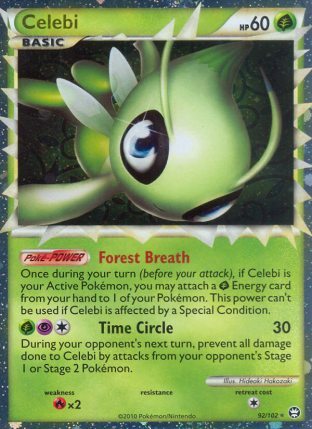 During my first year playing the game I played a couple of decks that were based around Celebi Prime, a Basic Pokemon whose Forest Breath Poke-Power let you attach a Grass Energy from your hand to one of your Pokemon once per a turn when Celebi was active. The first deck that I built around it was a Celebi/Hydreigon NVI deck that used Forest Breath to accelerate to Hydreigon to power up its Berserker Blade attack which cost [D][D][D][D] and did 60 damage plus 40 damage to two of your opponent’s bench Pokemon. Hydreigon had an Ability, Dark Aura, which made all Energy attached to it Dark Energy, allowing you to power up the attack with a couple of Forest Breath and a Double Colorless attachment. The deck was fun and showed some potential, but it never formed into anything significant for me. With the next set, Next Destinies, we got Skyarrow Bridge, which allowed Celebi Prime to retreat for free making it even more powerful. We also got Mewtwo EX, a very strong Basic attacker to accelerate to, and with that, the CMT archetype was born. I never actually liked Tornadus EPO in the deck and never played it, so mine wasn’t a true CMT, I opted to play Pokemon like Regigigas EX and Pinsir NXD instead in the deck. Regigigas was tough to take down in one hit and it had an Outrage like attack in Raging Hammer letting you hit something hard when your opponent failed to OHKO Regigigas. Pinsir NXD was a niche card that I used for its Power Pinch attach to discard Energy and it also served as a Grass counter to Terrakion NVI decks during the second week of States that year. Looking back at this list, I’m not surprised that I managed to find some success with this list. The list is really well built with good counts of everything making for what was a very consistent deck. I’m a little surprised I was able to actually make a list that consistent my first year playing. I think the only major thing I missed on was playing Shaymin UL in the deck, as I didn’t recognize how strong that Poke-Power was back then. This deck was really important to me as it was the deck that I feel had started to put me on a good trajectory as a player. Given this deck’s importance to me, I was super excited to see the first scans of Reshiram, Hydreigon EX, and Double Dragon Energy, all of which would allow me to build a deck using similar game mechanics. After seeing the scans for the new Dragon cards, I went into research mode, looking over scans of every single Dragon card in the format. I made a list of Dragon cards I thought had potential, and put together a few decks that I thought had potential and then went off to testing to find which ones worked and which didn’t. While most of the ideas didn’t work, I did find a Dragon deck that worked really well for me. After a couple of weeks of testing, I came up with what I thought was the perfect list for this deck, or at least as good as I was going to get to for the early stages of the format. I had to give up testing for a week and a half to focus on testing stuff like Gengar EX, M Manectric EX/Empoleon, and Exeggutor for Kansas Regionals, so I was a little fearful that the deck might not be as strong as other decks progressed in that time span, but I was relieved to find the deck continued to test well after I resumed testing after Kansas Regionals. The first thing that I want to point out about this deck that it isn’t really a straight forward deck. It is very much a Tool Box deck where I wanted to use a variety of attackers for different situations. Both of the Latios EX’s, Reshiram, Hydreigon EX, and Druddigon are very strong attackers, and Altaria can even be a useful attacker at some points of the game. I felt with Lysandre’s Trump Card to get Pokemon back, playing lower counts on all of them would work well enough as I could always get an attacker I needed later back into the deck to use again. In the deck breakdown, I will try to describe situations in which each attacker was most useful. I used every attack printed on all of my Pokemon except Swablu at some point in the tournament. 2 Reshiram ROS – The primary role of Reshiram in the deck is as an Energy accelerator. 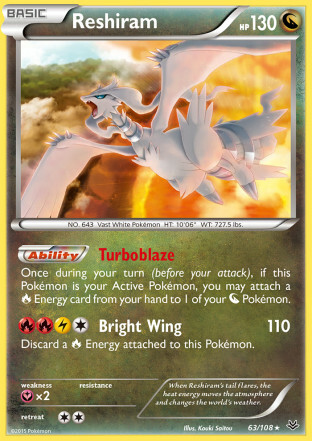 Its Turbo Blaze Ability lets you attach a Fire Energy from your hand to one of your Dragon Pokemon once per a turn when Reshiram is Active which lets you gain a turn of attachment letting you setup attacks in a single turn. Its Bright Wing attack is also usable, and far easier to power up than its [R][R][L][C] attack cost would lead you to believe. It can be setup in one turn by using Turbo Blaze to a benched Reshiram, retreating into that Reshiram and using Turbo Blaze to itself and then attaching a Double Dragon Energy. With a Muscle Band, it can OHKO 130 HP Pokemon, and with a few Altaria in play you can even OHKO some EX’s. 4-4 Altaria DRX – This Altaria is still legal thanks to a shiny reprint in Boundaries Crossed. Its Fight Song Ability adds 20 damage to your Dragon Pokemon’s attacks.This Ability stacks, so for each Altaria you have in play, your Dragon Pokemon’s attacks do 20 more damage. So if you get three Altaria in play, your Dragon Pokemon’s attacks are doing 60 more damage than they normally would. Its Glide attack costs [W][M][C] and does 40 damage. It can be setup in a single turn with a Turbo Blaze and a Double Dragon attachment. You don’t want to be attacking with Altaria too often, but with a couple Altaria in play and a Muscle Band attached it can easily reach 100 damage which is good for knocking stuff out like Night March Pokemon, Raichu, and Flareon so that you can try to stay even in the prize trade by only giving up a non-EX attacker. I really wanted to play the Legendary Treasures Swablu as it has a Charmeleon in the artwork and it does have the potential to paralyze something, but being unable to accelerate to it with Turbo Blaze or attach Double Dragon Energy, situations wouldn’t arise where I could power up its [C][C] attack cost. 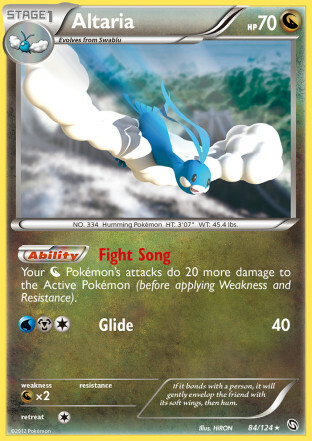 The Roaring Skies Swablu attacked for just [C], and while its attack is lackluster, I felt that it would be more likely to be useful if I ever had to use it as I never envisioned myself being able to get use out of a situation where I have to attach twice to a Swablu. 2 Latios EX PLF – This is a card that has been useless for its entire lifespan up until now, but with the added Dragon support it was finally usable and it is able to work in this deck as a power hitter. 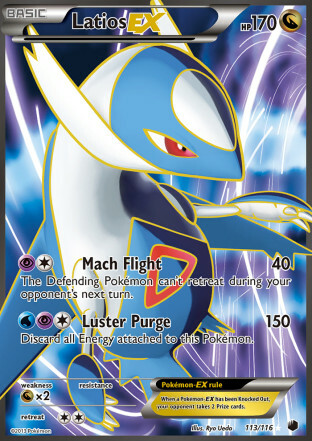 Its Luster Purge attack costs [W][P][C] and does 150 damage, and you have to discard all Energy attached to Latios EX. With a Muscle Band it can do 170 damage, and for each Altaria in play you can add 20 damage to that total, so with one Altaria it can go up to 190, 210 with two, and 230 with three, and 250 with the mythical four Altaria in play. You can setup Luster Purge in one turn with a Turbo Blaze and Double Dragon attachment. The way I looked at Luster Purge was as the equivalent to using an attack like Black Ballista in Blastoise decks. You didn’t necessarily get it whenever you wanted, but you only needed to get three of them off to win the game. You could also play Hypnotoxic Laser and Virbank City Gym alongside Altaria to further boost the damage output, making it easier to knockout something like M Rayquaza EX, but I found just maxing out Altaria at 4-4 to be a better resource investment in a format that looked like it would have heavy amounts of Item lock decks. Its first attack, Mach Flight, costs [P][C] and does 40 damage and your opponent can’t retreat that Pokemon during their next turn. This attack can be setup with a single Double Dragon attachment and can easily 2HKO EX’s and and stuff like Flareon with your damage boosters. The effect of the attack is really good as well, as you can Lysandre something up that can’t attack, and if your opponent doesn’t have a way to switch that out of the Active, you could hold something captive to knockout on your next turn. 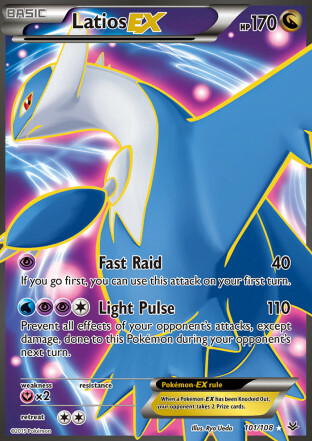 1 Latios EX ROS – This was a later addition to the deck, and it was in the deck to take donks. Decks like Night March, Flareon, and Raichu all have lots of Pokemon that you can donk with a Muscle Band, and even decks like Seismitoad EX and M Rayquaza EX have Pokemon that you are able to donk. For those that don’t know, donking is when you win the game on the first turn of the game without allowing your opponent a turn in the game. You are able to donk with this card because its First Raid attack, which costs [P], says that if you go first you can use this attack on the first turn of the game. With 3 Shaymin EX in the deck, you can dig through a lot of your deck to try to find Latios EX, a Muscle Band, and an Energy to attack with. I would say that in my testing I got the donk in a strong majority of the games where the opportunity presented itself. During the actual tournament, only one such opportunity presented itself, and Latios came through to donk an Exeggcute. Its second attack, Light Pulse, is solid when you happen to get two attachments in a row with two Double Dragon Energy or a Double Dragon Energy, Psychic, and a Turbo Blazed Fire. It does 130 damage with a Muscle Band, and then it can also OHKO EX’s with Altaria’s damage boost while also not discarding any Energy attached to it allowing you to continue attacking with Light Pulse if your Latios doesn’t get knocked out. 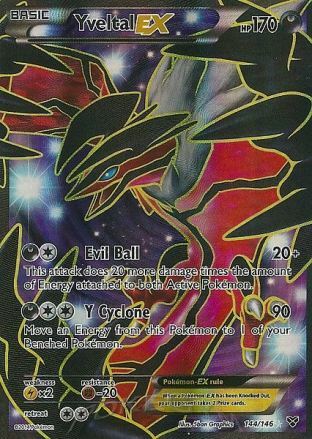 2 Hydreigon EX – This is one of the most important cards in the deck as it gives the deck lots of mobility. 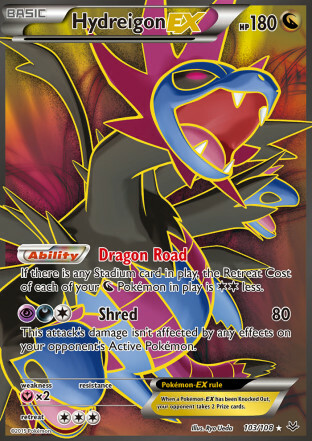 Its Dragon Road Ability decreases the retreat cost of your Dragon Pokemon by two when there is a Stadium in play. The Ability stacks, so if you have two Hydreigon EX in play, the retreat cost of your Dragon Pokemon is reduced by two. Most of the Dragons have two retreat cost, so they get free retreat from Hydreigon EX, but some Pokemon, such as Hydreigon EX itself have a higher retreat cost, and would need to discard an Energy or get a second Hydreigon EX in play to retreat. I think being able to move around freely under Item lock is one of the strongest assets a deck can have in this format and something I have been trying to make sure that all of my decks have available to them. Its Shred attack is also a very strong addition to the deck. It does 80 damage for [P][D][C] and it goes through all effects on the Defending Pokemon. 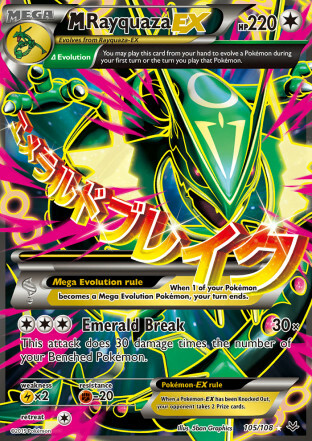 This means that it goes through Abilities like Safeguard and Intimidating Mane, and with the deck’s damage boosters it can OHKO all of the Pokemon with these Abilities, while also being able to 2HKO an Aegislash EX. 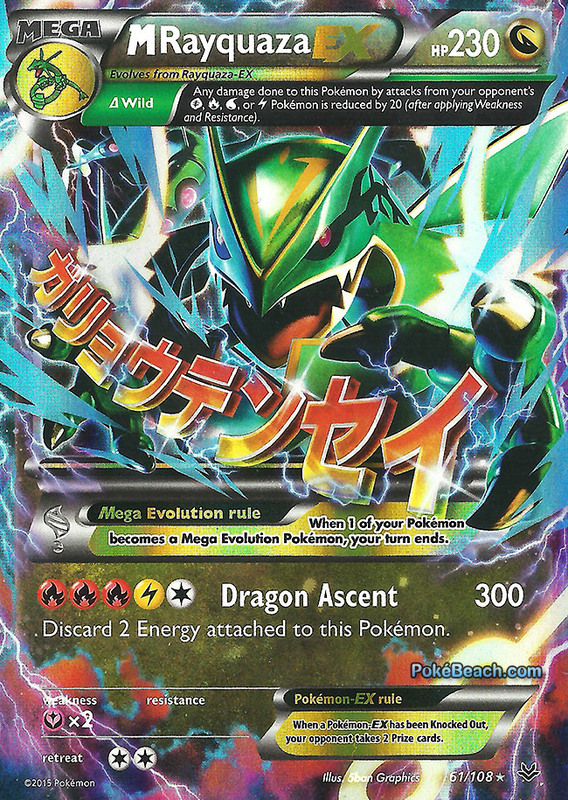 2 Druddigon FLF – This is one of the most important attackers in the deck as it is a non-EX attacker that can trade with EX Pokemon. 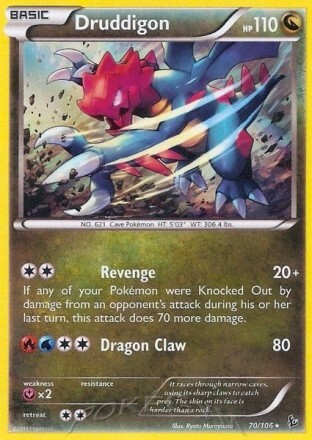 Its Revenge attack costs [C][C] and does 20 damage plus 70 more damage when one of your Pokemon was knocked out from damage of one of your opponent’s attacks during their last turn. It can be powered up by Turbo Blaze followed by a manual attachment or just attaching a Double Dragon Energy to Druddigon. This can become 170 damage with three Altaria in play and a Muscle Band on Druddigon. More importantly, it is 110 damage with just one Altaria in play or a Muscle Band attached which is enough damage to OHKO a Shaymin EX. A large part of this deck’s strategy in some matchups, such as against M Rayquaza EX/Shaymin EX for example, is using Lysandre on a Shaymin EX and knocking it out with Revenge to trade a non-EX for an EX Pokemon. While this attack is best used after a knockout for a lot of damage, it is still usable without a knockout as it can get into the 80-100 range depending on how many Altaria you have in play which can be a solid enough attack if you find yourself in a tough position. It also has a second attack, Dragon Claw, which costs [W][R][C][C] and does 80 damage. If you already have Energy on Druddigon, you can just attach a Double Dragon to Druddigon to do more damage. For example, in one of my matches I used Revenge for 60 damage (two Altaria in play) on a Seismitoad EX. My opponent then used Lysandre on a Hydreigon EX and used Quaking Punch. I played down a second Hydreigon EX to retreat the Active Hydreigon EX, attached a Double Dragon Energy to the Druddigon and used Dragon Claw for 120 damage to knockout the Seismitoad EX. 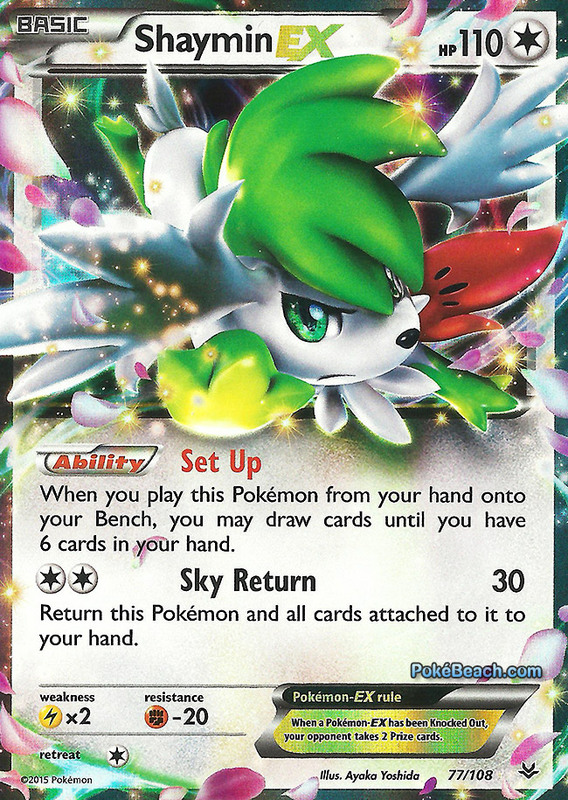 3 Shaymin EX – Shaymin EX is in this deck for the same reason it’s in every other deck and that is for extra draw power that doesn’t use your Supporter for the turn. You have a lot to setup in this deck wanting to swarm as many Altaria as possible, so you really need the extra draw power to setup fast to deal with the speed of some of the decks in the format. Playing Shaymin EX let me get away with playing a few less Supporters than usual, just going with 4 Juniper, 2 N, and 1 Colress for my draw Supporters along with 4 VS Seeker to re-use them. With Shaymin EX, all 4 of your Ultra Ball can be looked at as potential draw cards as you can fetch a Shaymin EX, and you also have Computer Search to grab a draw Supporter as well if you need it. I was only able to fit in 2 Lysandre, which I think worked well enough with VS Seeker maxed out in the deck, but I really would have liked a 3rd to have it in hand more often when I wanted to use Revenge, but just the two worked well enough. 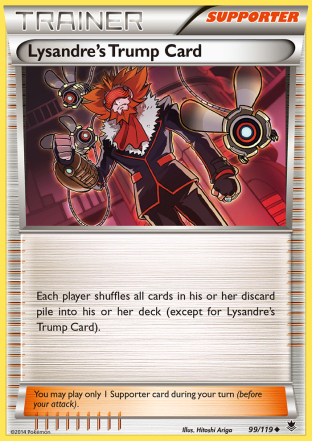 The deck also plays Lysandre’s Trump Card to get your Double Dragon Energy back in the deck, as well as any Pokemon that you needed to discard earlier in the game in your attempt to get setup. 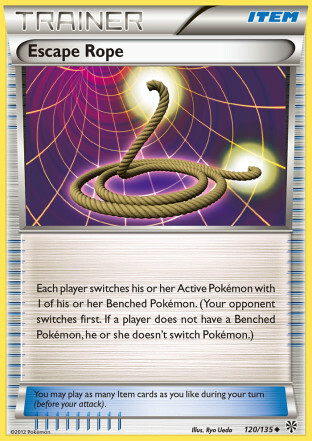 2 Escape Rope/1 Switch – I originally just had 3 Switch in the deck, but thought Wobbuffet could see quite a bit of play so I took two out for Escape Ropes, so I wanted a way to get around those to activate Turbo Blaze on my Reshiram as well as to be able to use Setup with Shaymin EX. Escape Rope was also very clutch in many situations as it wasn’t uncommon for your opponent to end up with a field where they just had a main attacker setup, and then a bunch of Shaymin EX, and maybe a weaker Pokemon. 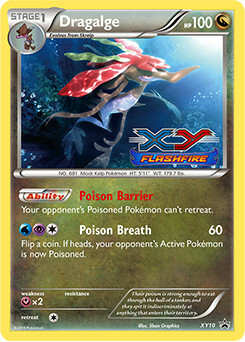 For example, against a M Rayquaza EX deck, they could have a M Rayquaza EX up and attacking that you can’t knockout, but with an Escape Rope, you could bring up a Shaymin EX that may be able to be knocked out by Revenge, or something like an unevolved Rayquaza EX that you can knockout with Luster Purge. 1 Energy Retrieval – I found the deck to be able to draw into Energy easy enough early in the game with Setup, but I still wanted a way to be able to search out two Energy at a time to get Revenge setup in a single turn. With Energy Retrieval, whenever I had two Basic Energy in the discard, I could instantly grab both Energy I needed for a Turbo Blaze and attachment to setup Revenge in a single turn. It also essentially acted as two extra Basic Energy in the later game, allowing me to go more turns without having to use Trump Card. 3 Muscle Band – While Altaria is great, Muscle Band is a far easier means to setup than Altaria’s to get a damage boost on your attacks. Just by itself it allows you to hit some imporant numbers, 170 damage with Luster Purge to knockout 170 HP EX’s and 110 damage with Revenge to knockout Shaymin EX. It’s also important to play some type of Tool in EX based decks just to get something attached to your EX’s so that your opponent can’t put a Head Ringer on your Pokemon. 3 Sky Field – You are almost forced to play this Stadium by necessity, otherwise your bench gets a little too cramped for comfort. Under your ideal setup, on the field you want a Reshiram for acceleration, a Hydreigon EX for free retreat, and 1-2 attackers, and 2-3 Altaria. Just those Pokemon can take up your entire bench leaving no room to play down a Shaymin EX to use Setup (or alternatively you could have Shaymin EX filling your bench and have no room for the Support Pokemon you need on your bench). With Sky Field in play, you get 8 bench slots which is three more than usual, giving you plenty of room for a few Shaymin EX and plenty of Altaria to boost your damage, as well as two attackers. 1.) Some decks like Zoroark, Raichu, and M Rayquaza EX do more damage based on the number of Pokemon they have in play/on their bench. If you can stick a Mountain Ring in play and your opponent doesn’t have the counter Stadium then they can easily miss the damage output needed to OHKO one of your EX’s. 2.) 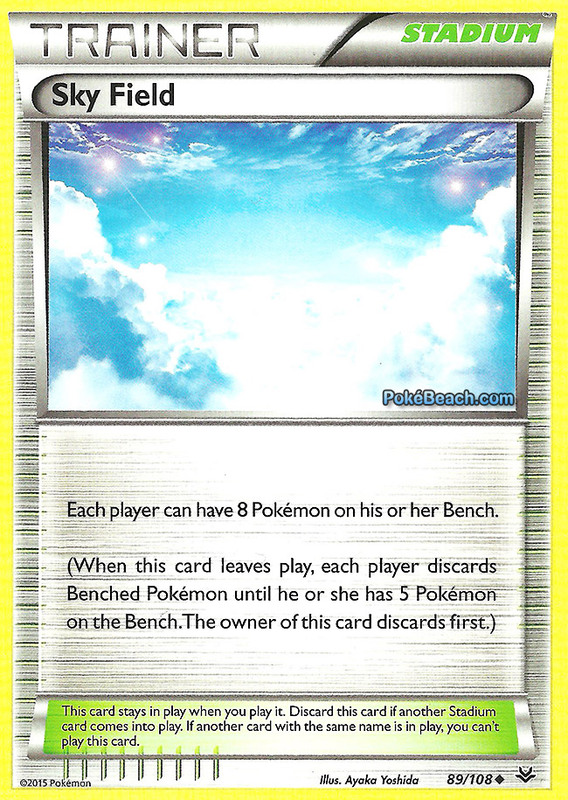 I would play Mountain Ring as a means to discard my Shaymin EX so that I could use Lysandre’s Trump Card to put them back in my deck so that I could play them again once I got another Sky Field into play. Additionally, it can be used to remove liabilities on your bench to potentially prevent your opponent from having a game winning knockout available to them on your bench. I think Mountain Ring is the best alternate Stadium for this deck. Scorched Earth might seem like a logical choice, but you don’t play enough Basic Fire Energy to really be able to use them to discard for additional draw. 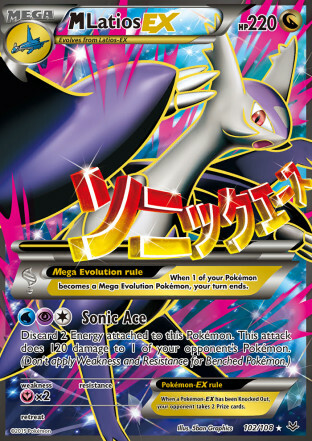 Shadow Circle was also a consideration to remove the weakness of Pokemon with Double Dragon attached, but the Pokemon’s weaknesses weren’t prevalent in the meta game and the deck generally discards its Double Dragon Energy whenever it attacks or the attacker has low enough HP that it will just be knocked out during your opponent’s turn. In this deck, Mountain Ring is a one sided Stadium, in that it can’t help your opponent and it can only help you. You play no snipe attacks, so there is nothing lost from your deck’s strategy when this Stadium is in play. However, against anything that play snipe attacks it could be useful for you. 5 Fire/1 Psychic/4 Double Colorless Energy – I would have liked a few more Fire Energy for increased consistency, but there just wasn’t room for more. With a single Psychic and 4 Double Dragon in the deck I felt that there were plenty of outs to find a usable Energy to get donks with Latios EX when the situations where it could donk you into a win presented themselves. 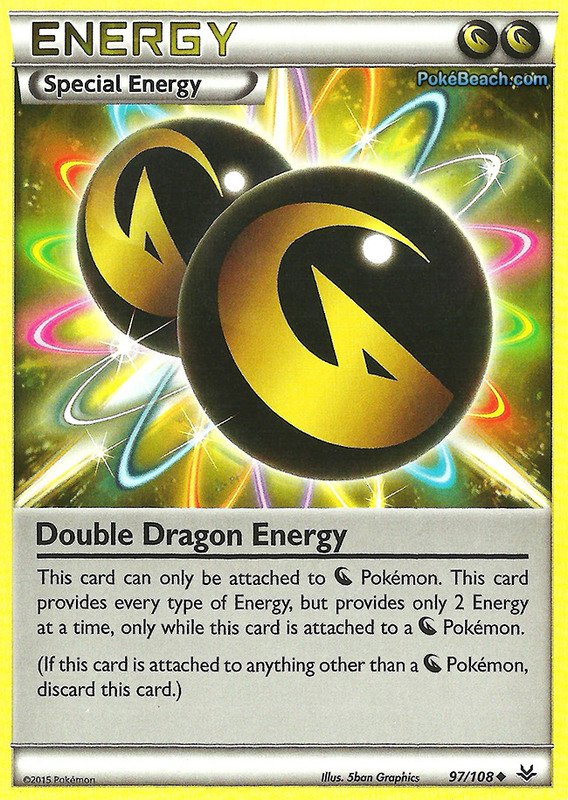 4 Double Dragon Energy is an obvious count as most of your Pokemon’s attacks are reliant on it to be able to get setup. This tournament was very long and was a bit of a grind with little sleep, so I don’t remember full details of all my matches. I think I got these matchups all right, but if I made a mistake please let me know. I won’t have a detailed recap of all of my matches but I will highlight some of the things I learned from some of the matches about the deck and format in general. In my second round matchup against Andrew, he pointed out something interesting that I didn’t really consider too much and that was how useful M Latios EX could have been against a deck like his. Raichu maxed out at 190 damage with a Silver Bangle, which is good to knockout a Latios EX or Hydreigon EX, but which would fall short of knocking out M Latios EX. If I had played 1 M Latios EX and 1 Spirit Link, I could have evolved into M Latios EX and potentially taken two knockouts on Shaymin EX’s creating a 4-2 prize trade when it is up, and after creating that type of advantage, I would have been able to use Druddigon to finish off the prize trade to my advantage. I’m not sure if this actually works in practice because with just 1 M Latios EX and a Spirit Link, consistency might have been a major issue in actually using it, but in theory, Sonic Ace, which costs [W][P][C] and does 120 damage to one of your opponent’s Pokemon at the cost of discarding two Energy attached to M Latios could swing a matchup like this. I purposefully left M Latios EX out, as I don’t think it traded well with EX decks, as something like M Rayquaza EX could then just return a OHKO on M Latios EX, keeping the prize trade even. The option I went with, using Druddigon and Lysandre was able to let me create a prize advantage. However, as Andrew pointed out, M Latios EX does have potential in matchups against decks like his that use non-EX attackers but are reliant on Shaymin EX to get everything rolling. A lot of people that I talked to the deck about just assumed that the deck was terrible against Item lock decks, but I maintained that I thought the deck had a very positive matchup against the Item lock decks. I think that proved true in the tournament, as I went 3-0 against such decks and 6-1 in individual games. I find that the deck functions quite well under Item lock and doesn’t fall victim to most of its traps. You have reduced retreat costs with Hydreigon EX’s Dragon Road, allowing you to get the Pokemon you want Active into the Active position whenever you want. You also have two forms of Energy acceleration (Turbo Blaze and Double Dragon Energy) allowing you to setup attacks in one turn. With two Altaria in play, I could use Luster Purge for 190 damage on a Seismitoad EX, good for OHKO’s, even if I didn’t get a Latios EX with a Muscle Band in play before the first Quaking Punch of the game. The matchup against Item lock decks are all about practicing patience. You won’t be able to function as you normally would, but you can still very much function under the lock. You just have to slowly get setup with multiple Altaria in play so you can score the OHKO’s with Luster Purge on a Seismitoad EX, and then just move Reshiram into the active slot and wait for your opportunities to use Turbo Blaze and attach a Double Dragon Energy in the same turn and then use Luster Purge. For Latios EX’s that don’t have a Muscle Band, you want to be really patient and just hold onto it until you may use it to avoid it ending up with a Head Ringer on it. Sometimes this isn’t possible, but when you can play it out this way, it is definitely the way to go. Similarly, you don’t want to make Energy attachments before you’re ready to attack, but if you’re going to discard them with Professor Juniper or something anyhow, you might as well attach them as you will lose them anyhow, and those types of attachments can bait out your opponent’s Crushing Hammers. 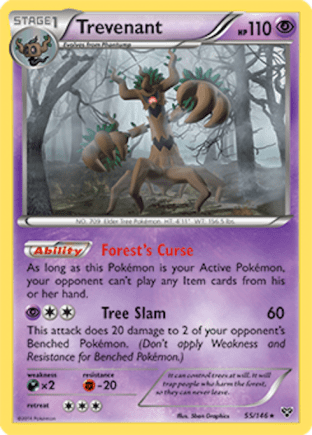 Once you notice that your opponent has most of their Crushing Hammer in the discard pile, you can start being more aggressive on using Turbo Blaze to get extra Energy into play, potentially setting up back to back turns of Luster Purge, or getting a Revenge setup for a potential Lysandre on a Shaymin EX. As you have mobility under the Item lock and more counter Stadiums than they have Virbank City Gym, you can generally get the math to work out to where they need to knockout your Pokemon with the actual damage from Quaking Punch and not the Poison damage which will activate the damage boost on Revenge. 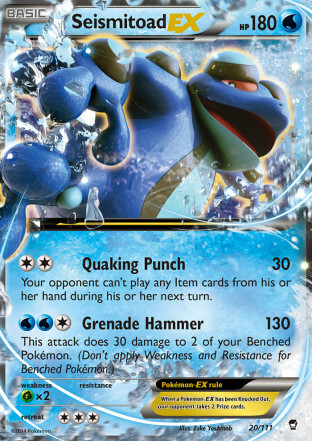 It takes a long time for Seismitoad decks to beat you, and you only need three successful Luster Purge’s in a game. You also force them into an awkward situation where there Crushing Hammer almost become dead cards as you mostly play without Energy on the field, which can clog their hand some diminishing the return on their Setups, or just lead to useless cards for them in hand after you use a late game N.
Against Trevenant, since you aren’t taking two prizes with each knockout you generally want to try to setup something like Hydreigon EX that doesn’t discard the Energy from itself when it attacks so that you can potentially stream together multiple attacks. You generally want to use Lysandre to take knockouts on Shaymin EX’s when possible. This works really well against Trevenant as it not only lets you take two prizes at a time, but it also breaks you out of the Item lock letting you play VS Seeker to get Supporters as well as attach stuff like Muscle Band to your Pokemon or play Energy Retrieval to get more Energy. In the turns where you break out of the Item lock, you can have some pretty explosive turns if you can chain some Shaymin EX’s together. Both Latios EX can also be useful attackers in the matchup against Trevenant, as they both can knockout lower HP stuff like Phantump for a low Energy investment. Mach Flight is also very solid against the Seismitoad EX/Shaymin EX deck as you can trap a Shaymin EX active that they can’t retreat, and they may end up reliant on hitting a heads on Super Scoop Up to get the Shaymin EX out of the active spot. They can use Sky Return to get Shaymin EX out of the active spot, but if they do that you saved yourself a turn of Quaking Punch and can use your Items again. Overall, the Item lock matchups worked out favorably for me. I think you just have to have a lot of patience and setup your field with Altaria and then wait for the moments when you have the right cards to take knockouts. My favorite matchup of the day was against Jared Weiss. We were both rocking Reshiram, and it was a very neat matchup where we both had to be very careful and pick our spots for when we attacked with our homerun hitters. I don’t remember a ton from these games because a lot happened in them, but it was definitely a fun match. In the end I finished at 6-2-1 on day 1 for 19 points and entered into Top 32, Day 2 Swiss as the 22nd seed. Both of my losses also made it onto Day 2. We had been working on a hybrid version of M Rayquaza EX for the past week, and going into Top 32 with just 19 points, I knew I would need a really good Day 2 to move into Top 8 (it ended up being that I would need to go 4-1 to make it), so I wanted a deck with a lot of raw power that could push me through to a good record. Unfortunately, I probably shouldn’t have played this version of the deck for this meta, and I destroyed the integrity of the deck with the changes I made, even if those changes were made with good intentions. Okay, so the mistakes I made. I changed the original consistency line (which played 4 Juniper/3 N/3 Colress) which let it operate really well under Item lock to an engine that worked really well for my friend Michael (who got his world’s invite with a Top 32 finish) in his Mega Rayquaza deck on day 1, but it was more well suited for his build, and didn’t transfer as well into the hybrid. The hybrid was meant to be a little slower in setup and conserve more resources, but then have a really strong later game. It operated better under Item lock, as its draw came from Supporters and not Item cards, and it just focused on getting some Spirit Links (which were maxed out originally) to Rayquaza EX and then just waiting until I got the right hand to Turbo Blaze, attach an Energy, and then Mega Evolve and then use Emerald Break for knockouts against Toad. However, where I really messed up was the change I made when I woke up in the morning. When I woke up, my mind was telling me that I needed more to deal with the Item lock decks, as I felt those would see play. So I ended up cutting some Battle Compressors and Switching cards to fit in Keldeo EX and 2 Float Stone. This had two negative effects on the deck – while Keldeo EX is good against Seismitoad EX, by limiting my switching options to the one Escape Rope it was difficult to get Reshiram active to use Turbo Blaze and then get back into a M Rayquaza EX to attack during the first couple turns of the game. Secondly, I cut into the consistency engine that Michael used by ditching some Battle Compressors, making the speed engine not as reliable as it otherwise should have been. One last thing to point out, is that the Hydreigon EX gives Reshiram and your Rayquaza EX free retreat. It also works as your answer to safe guard. The original list had 1 Muscle Band in it so it could take OHKO’s on Sigilyph and Suicune, but there wasn’t room for it when converting over to the speed engine. The one thing that hurt me really bad against Jason’s deck was his Dragalge. Even when I could get Keldeo EX with a Float Stone on it, it didn’t matter at all in the long run as he could just use a Lysandre on the Keldeo EX, poison it with Hypnotoxic Laser, and then it was locked active to die. 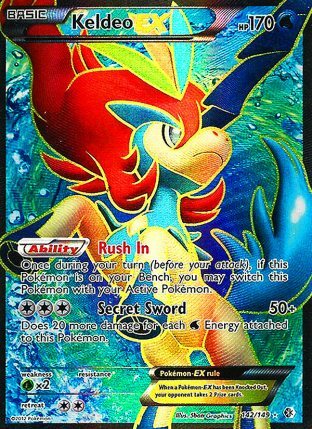 If you’re playing something like Keldeo EX to counter the status effects in the weeks until Lysandre’s Trump Card gets banned, you may need to include two copies of the card so that you can use two Rush In’s to get around Dragalge’s lock. I actually played against both people that I drove to the tournament with in Top 32. This was a likely outcome as we all entered into Top 32 with 19 points, so we were likely to get paired at some point in the tournament. Michael was the unfortunate victim of my god start in our game 3. I was able to go through just about the entire deck, getting six Energy on a M Rayquaza EX in the first turn along with a Float Stone on my Keldeo EX. With that kind of start, Seismitoad EX doesn’t stand a chance against you. I actually played a match with Edan the night before and won it 2-1, so I felt somewhat comfortable with the matchup, but all of those test games were very close, so I knew it could go either way. Ideally we could have just ID’d each other into cut, but we would have been leaving our fates to the resistance lottery. At least half of my previous round opponent’s lost their last round, Jason won his to move onto Top 8, and the other may have tied, so I would have finished either 9th or 10th if I had chosen to ID. If one more of my opponent’s had won their last round instead of losing it, I would have had a good enough resistance to get in as the 8th seed. That’s just the type of lottery you play when you choose to ID into a bubble spot. When there is uncertainty, I think you have to play it out and just live with whatever result you get in the game. It is best to do what these tournaments are intended for and go out and play your games. I had to scoop the first game a few minutes in because I didn’t open a Supporter and my lone Acro Bike in my opening hand provided no salvation, so there was no point on playing on. The second game was really close, but I missed the Float Stone for my Keldeo EX on turn 1, and then I fell a turn back on taking my 3rd and 4th prizes because I ran out of Sky Field so all I could do was hit his Seismitoad EX for 150, and then I fell a turn back from attacking and taking another prize when my M Rayquaza stayed asleep on a Hypnotoxic Laser sleep flip. He N’d me, which prevented me from getting another M Rayquaza out to hopefully sweep the game. I did get a Double Colorless Energy, so I could use Sky Return with Shaymin EX for the knockout on the Seismitoad EX, which I did to go down to two prizes. I promoted my Reshiram, but he had a Lysandre and enough Energy on Yveltal EX to use Evil Ball to KO my Rayquaza EX on the bench. From there all I could do was use Lysandre’s Trump Card and hope that I could pull out a miracle M Rayquaza EX for the last knockout. After a few Setups and some draw Items I didn’t get it, and had to use Sky Return into Reshiram again. He had another Lysandre in hand and was able to drag up a Shaymin EX for his last two prizes and that was that. I was really happy to see him do well at a big tournament, he played well, and he played what was an underrepresented deck during our Day 2 and showed people that Yveltal is still good. He also played Bouffalant in the deck, something that gets The Charizard Lounge’s stamp of approval in expanded Yveltal decks. In the end I finished 9-4-1 for 28 points and finished 13th overall, with a 6-2-1 Day 1 record, and a 3-2 Day 2 record. I think M Rayquaza was a very solid choice for Day 2 of the tournament, but I regret my deckbuilding decisions here, they weren’t very well thought out. The Dragon stuff was mostly useless as I played 4 rounds against Item lock decks, and that isn’t where it is useful. It is useful against Virgen, but the Colorless M Rayquaza is more than enough to give you a good matchup. So I essentially played Day 2 with 6 dead cards in my deck and still ended up in a win and in situation for Top 8. I think that just shows the raw power that M Rayquaza EX provides, it’s the strongest attacker in the game. I was probably just a little too enamored with Reshiram after Day 1, and from that I force fed playing a deck that I shouldn’t have been playing. I was really happy to see Missouri represent so well at this tournament. Myself, Michael Hopkins, Kolton Day, and Carrington Huffman all were able to finish somewhere in the Top 32, Edan Lewis and Dema Boatman made it into the Top 8, and Kyle Haverland went onto Top 4. Interestingly enough, a lot of Jason’s victory came from beating up on Missouri beating myself, Michael, and Carrington in Day 2 Swiss (and losing to Edan) and then beating Edan in top 8 and Kyle in Top 4. Congrats to Jason on his tournament win, he played really well and his deck was top notch. If you have been reading the Pokemon beats today, you have surely seen by now that Pokemon will be banning Lysandre’s Trump Card on June 15th. This deck really likes Lysandre’s Trump Card as it lets you get back Energy as well as Pokemon, but I don’t think it will be a dead deck without Trump Card. You only need a few knockouts with this deck to win games, and you have more than enough Energy to get that done as is, you just have to be more aware of your resources after the ban. I think I only used Trump Card in about half of my games. The first cut I would make for the deck is obviously Lysandre’s Trump Card, as you won’t be able to play it going forward. 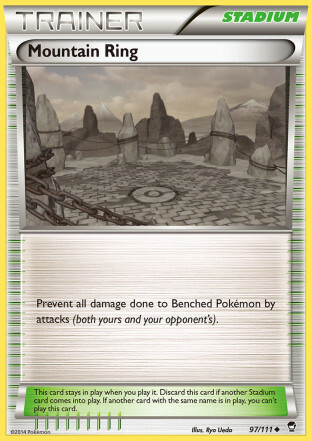 The second cut I would make is Mountain Ring, as it no longer serves its primary purpose of discarding your Shaymin EX’s to get them back with Lysandre’s Trump Card. 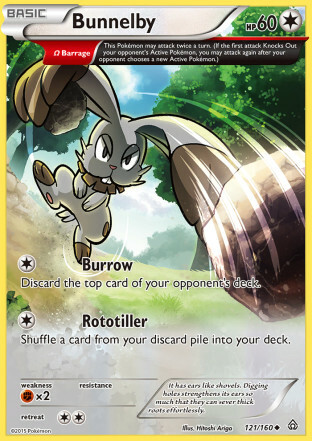 The first new addition I would make to the deck is Bunnelby PCL. It has an attack, Rototiller which costs [C] and lets you put a card from your discard pile back into your deck. It also has the Omega Barrage Trait, which lets it attack twice, meaning that you can use Rototiller twice in a turn to put two cards back into your deck. Its second attack, Burrow, lets you discard the top card of your opponent’s deck for [C] and in a format where you can’t shuffle your discard pile back into your deck, using Burrow twice might be able to steal some games for you with the deck out win condition. Rototiller is obviously very good for getting Double Dragon Energy back into your deck. Four can sometimes take you all the way, but sometimes you might need more because of early discards, and Rototiller could save you in these situations. The second card I would probably put in the deck is Sacred Ash. You often have to discard some Pokemon like Altaria early in the game that you will need later, and Sacred Ash will let you get these Pokemon back. If you play this deck in Expanded, Super Rod would be worth testing in this role as well. Overall it was a great weekend and I was able to meet some people that I’ve talked to online and it was really nice to do well with a deck that I’ve been working with as my primary deck for the new format. It also gave me consecutive Top 16 finishes at Regional Championships in back to back weekends, and it’s always nice to have some consistent successes. The Top 16 finish gave me 45 more Championship Points to put me at 431 points total on the season. They haven’t updated the rankings yet, but I know it is good enough to firmly place me somewhere in the Top 64 in North America (I entered the weekend at 60th), so in the last two weekends I was not only able to cement my place in the stipend money, but jump up a level as well. My bank account will certainly thank me for this later in the summer. Featured Image from czyber on DeviantArt. Check out more of their work here.